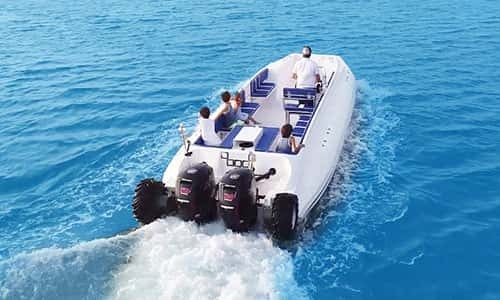 Ocean Craft Marine (OCM) is once again the trendsetter in the leisure marine market with the launch of another successful innovation The Amphibious Beachlander. “Boating is for everyone and at OCM we are making sure of it!” says Roy Nouhra, Founder and President of OCM. With the newly-launched Amphibious Beachlander range, accessibility is the ultimate luxury enabling anyone to come safely onboard. OCM Amphibious boats, that is boats with wheels, can take you anywhere, but the new Beachlander option opens a whole new world of opportunities to any boating experience. Not only can you drive straight onto any beach, but now you can also open the bow and allow your passengers to gracefully walk or wheelchair ashore safe and dry. The bow has a hydraulically controlled ramp which can be lowered to facilitate the loading and off-loading of passengers, equipment and camping gear amongst many other uses. 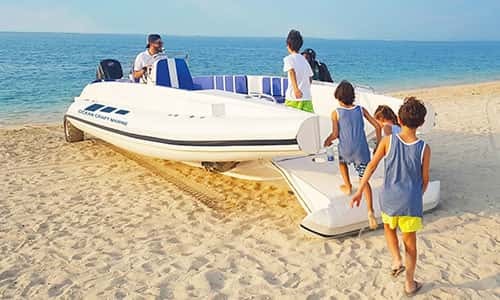 The most functional yacht tender, the Amphibious Beachlander offers the capacity and luxury to safely deliver passengers ashore in almost any sea state, yet allows the crew to stage and provision the beach for picnics and outings. Customized and optimized to cater to the needs of superyachts, these amazing tenders can be outfitted for any water activity and are ideal for diving, Seabobs, kite boards, or just soaking up the sun. The bow ramp can be used on land to easily load all the diving gear, and at sea can be lowered and used as a safe diving platform away from the engines. It is great for hotel resorts as well, where hotel guests can walk into the boat directly from the hotel beach, enjoy the sea and elegantly walk out of the boat on any beach or island reached. The boat is designed to make it easy for disabled people with wheelchairs to come onboard and operate the boat on their own.